Cater to your hungry lawn this April with Scotts® Step® 1 Crabgrass Preventer Plus Lawn Food, available at Rocky’s Ace Hardware. Few things in life make you feel better than a good meal, and the same goes for your lawn. A full, green one delivers the quintessential backdrop for all your summer activities from barbecues and parties to playing outside with your children. After lying dormant all winter, your grass will be eager for a meal. Ensure a greener pasture this year by feeding it Scotts® Step® 1 Crabgrass Preventer Plus Lawn Food for its first course. Make certain your lawn is prepared to absorb the nutrients by taking care of some necessary maintenance. Use a rake to remove scattered debris, including sticks, twigs, leaves and dead grass. Make the first cut of the season with your lawnmower and adjust your cutting deck to its highest possible setting to help your grass grow thick, deep roots. Step 1 works best when applied in early spring, between March and April, as temperatures are still cool. The earlier you fertilize your lawn, the better it will be protected from the drought and stress of the summer months. Step 1 is essential to prevent weeds, like crabgrass, for up to four months, and unlike generic options, it controls them before and after germination. Apply it when your grass is dry and use a seed spreader to yield the best results. We also recommend adding side orders of lime and grass seed during this course. Lime counteracts the acidity of the soil and replenishes depleted nutrients, while grass seed will green up any brown or dead patches on your lawn. It tends to rain often during the month of April, but some homeowners still feel the need to water their lawns constantly to bring it back to life. Ignore that feeling! Extra watering doesn’t help it grow faster or greener and could affect the Step 1 process. For best results, your lawn should receive a half inch of water from rainfall or watering within two to three days after application. In general, it only needs one inch of water per week in the absence of rainfall. 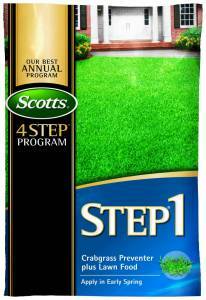 If you’re ready to cater to your lawn this year, serve it Scotts® 4-Step® Lawn Care Program, available at your local Rocky’s Ace Hardware. Don’t forget to print a copy of our lawn care schedule to help plan its next meal.